15-year-old Beth Doherty is here to hold you accountable for your lack of action on climate change. ‘As an adult reading this – you have power, I don’t have any,’ she writes. “YOU SAY YOU love your children above all else, and yet you are stealing their future in front of their very eyes,” said Greta Thunberg, aged 15, when she spoke this week at the United Nations Climate Change Conference summit in Poland this week. This perfectly sums up the very real threat that climate change poses, not just to teenagers like me and Greta, but all of those children born after us too. We’ve known climate change was a reality for decades now, so why has nothing been done? One thing is certain, Ireland will come nowhere near meeting our EU 2020 targets. The fact that our government is happy to allow Ireland to fall so far behind and contribute so greatly to climate change, is harrowing to me and it should be to you too. The sad truth is that climate change has long since claimed its first victims. So far in Ireland, we’ve been very lucky to not yet be severely affected. But our climate is changing and storm Ophelia was the result of warming waters. By global standards Ophelia was mild. In other parts of the world, people have been seriously affected already. In September, Hurricane Florence hit the US East Coast, killing 53 people, including two babies. On the other side of the world, in Hong Kong, Typhoon Mangkhut killed more than 100 people. In total, 5.7 million people were affected by that storm – that is more than the entire population of Ireland. Every single one of those people had a life, a family, a future, just like you and me. They are among the early victims of climate change, sadly they certainly won’t be the last. Their deaths are the result of inaction on the part of governments around the world including ours. The simple truth is that our planet is heating up like never before, causing Arctic sea ice to shrink by over 4 million square kilometres. We don’t have anywhere else to go, our entire species is reliant on planet earth for your survival. Last year the Guardian reported that just 100 companies are responsible for a shocking 71% of global greenhouse gas emissions. You might say close those companies tomorrow! Of course, we need to each change our lifestyles. Here in Ireland, we’re the third highest producer of emissions per person in the EU. I think a massive part of the problem of climate change is that we view it as this abstract concept, it’s in the news, on the TV, but when does it actually affect our day-to-day lives? We can go to work, to school, for coffee, all the while safe in the belief that it will never really affect us. But we couldn’t be more wrong. Individuals should make changes but our government needs to start taking radical action fast. They have the power to make dramatic changes, we should be leading the way in Europe and the world, instead, we are lagging behind at the very back. Ireland is the worst performer for climate action in the EU. We are 20 points below the EU average and we also rank 13th from the bottom out of the 56 developed countries in the Climate Change Performance Index. I have such a mix of emotions about this issue, I feel anger, sadness, frustration and fear. Anger that for decades before I was even born, climate change was known about and there was plenty of time to fix this before we got to this desperate situation that we’re in now. Anger that by the time the children who are currently in junior infants in my school get to transition year, where I am now, it might already be too late to turn back the clock. Sadness that my own children, if I have them, will grow up in a polluted world, where the spectre of climate change looms over them in every single news report. But, most of all I feel an incredible sense of frustration that our governments are listening to the rich, privileged, greedy few who own shares in big oil companies, rather than to their ordinary citizens, or to the worlds poor, who will suffer most as a result of climate change. My classmates and I will reap the consequences of that greed. Some predictions say that by 2030 it will be too late to turn back the clock on climate change. That is just 12 years away and I’ll be 27. My friend’s little sister will be 16. Every single child around the world is having their futures stolen by this. So tell me this – what are you going to do about it? Will you just continue to write it off as someone else’s problem? When 5 million people, 100 million people, 8 billion people all write-off climate change as someone else’s problem, that is why we are accelerating towards that point of no return. As an adult reading this, you have power, I don’t have any. That is why I’m begging you to vote for politicians who care about climate change. I know that it is easy to become disillusioned with Irish politics, but by not voting or by staying silent, you are creating a future where nothing is done. Why wouldn’t you want to give your kids a future where they can grow up safely in a habitable world? We all need to do something today – no matter how small it is, everyone can make a difference. Why not call your political representatives and tell them that your number one priority in the next election is that Ireland meets its climate change targets? You could buy renewable products, refill water, recycle more, shop less. You could go to demonstrations, consider becoming vegetarian, use public transport more or change to an electric vehicle if you can afford one. Why not change your electricity supplier to the ‘greenest’ one, they are no more expensive the others? Switch to eco-friendly cleaning products, walk to work, whatever. What we cannot do is just continue to ignore climate change, it won’t go away unless all of us, everyone reading this, does something. This is the biggest crisis facing our entire species, maybe the biggest one we’ll ever face – please don’t wait until it’s too late. You can start making changes today by signing my petition calling on Minister for the Environment Richard Bruton to take action on climate change. 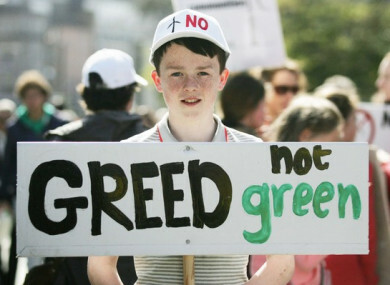 Beth Doherty is an environmental activist from Dublin aged 15. She is studying Early University Law and Politics in DCU and is as a member of the European Youth Parliament Ireland and Comhairle na nÓg. Email “Opinion: You say you love your children - so why are you stealing our futures?”. Feedback on “Opinion: You say you love your children - so why are you stealing our futures?”.